By and large the most fascinating period in women’s fashion.Beginning with the art deco style that spilled over from the late 1920’s. 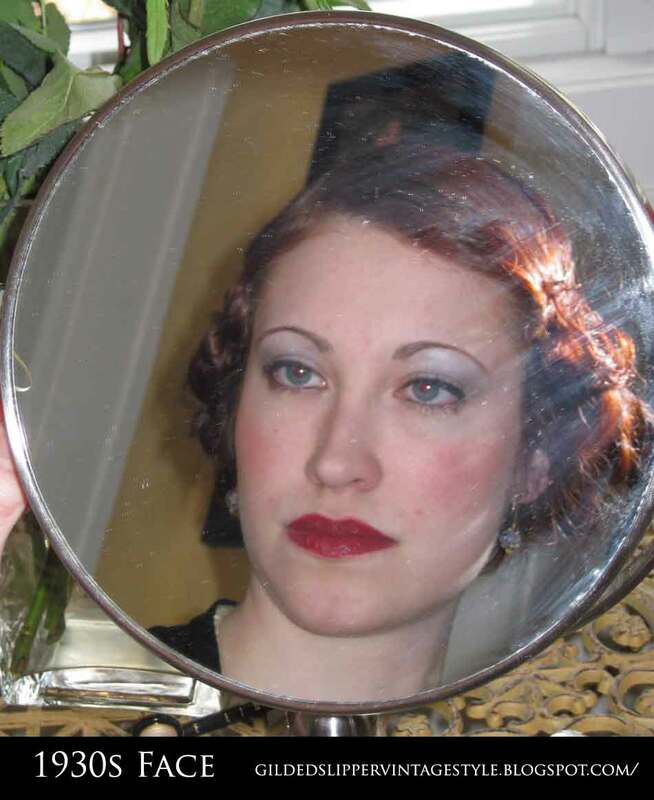 The feminine makeup look changed rapidly from the late 1920’s and in to the 1930’s. Gone was the coquettish girl of the late victorian era, to a more independent woman. The pale face look remained however, despite Coco Chanel’s new tan! 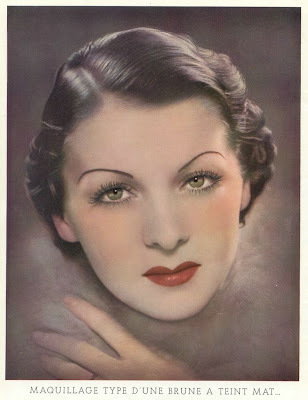 The makeup look of the early 1930′s was of an aesthetic female, somewhat aloof. The makeup reflected this with paler than pale skin [ bleach creams achieved this ]. 1.Face powders went for the ivory look. 2.Eye makeup of the 1930’s. A curious black line traced from the tear duct to the end of the eye, including a little upturned triangle effect! Upper Eyelashes were heavy with mascara or ‘ Mascaro’ as it used to be called then ! Lower Eyelashes had little if no mascara. Eyeshadow went from lash line to crease,blending upwards and outwards. Eye shades varied over blues, bright violets, greens, browns and orchid. Blondes loved blue, green or bright violet eyelid shades, while Brunettes went for purples and browns. In the evenings – brightly shimmering eyelid shadows from the upper eyelid up to the eyebrow, with dark eyeshadow in the crease of the upper lid, slightly smudged to create a deep set effect. Eyebrows were plucked into virtual non existence with a fine taper line in its place,falling at the end. 3.Lip makeup of the 1930’s were fine and thin and horizontal in shape. The upper lip might be made to look a little longer in the evenings,to create the ‘Rosebud look’. Popular Lip colors were dark -chinese red,browns,maroons,rasberry tones. Blushes started out in 1930 with bright pinks, still echoing the Flapper days of the previous decade,becoming more discreet in the late 1930s.Brown rouge became more common also. 4.Popular Nail Polish included pale rose, light pink and cream shades,applied only in the center of nails with the half-moon and tips left bare. Quite a practical and sensible approach. You can see a brilliant ‘ how to’ 1930s makeup guide on The Gilded Slipper. Thanks to Tia for letting us republish her final result below – which is, I’m sure you’ll agree a very authentic look. 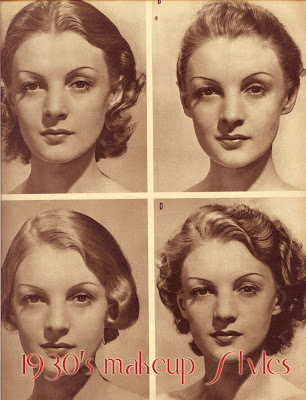 You can download beautiful original vintage 1930’s make-up and beauty guides now. Also 1920’s Flapper make-up, 1940’s make-up & beauty and 1950’s beauty looks. The 30s are my fave decade and I do wear my makeup 30s style with just a little eye shadow on the lower part of the lid and mascara on the upper lashes only. I use Benefit's Benetint liquid rouge and it gives you a great natural looking flush and stays on for hours. I love that Savage makeup ad. I collect 30s makeup and so far I haven't been able to find any Savage but I'm always on the lookout for it. Lovely post! The hairstyle were beautiful! Fantastic post! I love reading about vintage makeup tips. Great post! Lots of really good tips – love it! This is such a fantastic post! Thanks for sharing it. Great post! Thank you! Any ideas what they used as bleach creams? Hydroquinone? Thanks for sharing this! How beautiful. Oh, this is the most glorious post. THANK YOU! I was happy to learn that I've essentially been applying my eye makeup 30s style since I started wearing cosmetics decades ago. Still haven't taken the plunge-er-pluck with the authentic 30s eyebrows, though. Anyway, I am writing ALL this down. SO informative.